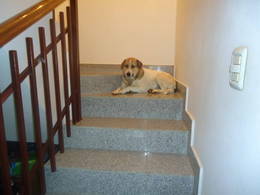 When I took Minnie in our home, I didn't think of what this dog might do for me, except of giving me love and affection. Minnie is our dog. She is rather small, yet very brave! She is a stray, who was wandering around a few years ago, when I felt sorry for her and took her inside the yard. Ever since that day, Minnie has been very grateful and has become more and more confident and fearless - although, not so fearless when she hears thunder! Even from the beginning of our friendship, she made it very clear that she fears thunder and lightning and has always asked for help, by jumping on the front door or on the kitchen window sill. Now that I know what she wants, I open the door and invite her in, where she goes up on the stairs, where she feels safe. She has the same fear of fireworks on New Year's Eve. Her first one with us, was a bit scary for her, until I figured out why was she jumping, so desperately, onto the front door - so desperately that she scratched the handle while probably trying to open it. The poor girl was also afraid of fireworks, like most dogs are! I'm sure her life out there, as a puppy - until she came to me - wasn't easy, that's why I want to comfort her as much as I can. Consequently, I spend every New Year's Eve with Minnie - since everyone else goes to sleep very early. She was about two years old when I found her. She was pregnant and scared, She has certainly become a character in my stories! After being surrounded with love and care, Minnie has started to feel like home. All the yard is hers and she sure acts like it! 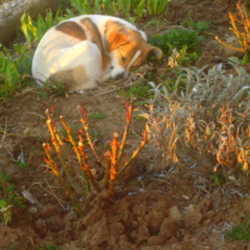 Her shape and behavior reminds of a Jack Russel terrier, although she is bigger, more like a beagle. 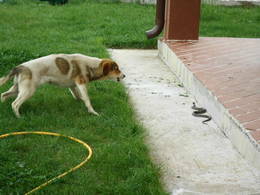 Probably that's why she hunts all the critters in our yard, such as lizards, mice, rats, snakes, sparrows, even moles. As fearful as she might appear, she is not at all scared of any of them! I often find her laying on the lawn and looking at her trophies: a lizard or a mouse, a snake or a mole. I know she hunts sparrows too, because I sometimes see one in her mouth, or just find the fluffy remains in the grass - poor birds! Minnie also eats mice. This isn't because she is hungry, but because of her hunting instincts. Sometimes, I can get her "lunch" out of her mouth, if I am out and close to her, when it happens. 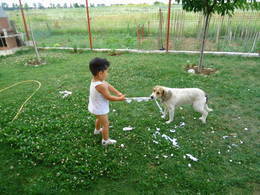 Otherwise, she chews the poor creature so fast, that I barely have time to put my shoes on! Of course, there are times when she just leaves the dead critters on the lawn, until I come and throw them in the garbage can. She sometimes gets special "gifts" - baby sparrows which fell (or, were thrown?) from their nest. They say the mother bird usually throws her sick babies out of the nest. Well, that doesn't seem to bother Minnie, who eats them in an instant. I've often found baby sparrows down the terrace and felt sorry for them, even tried to put them back in their nest. But the next thing I knew, the poor bird was out on the floor again - which gives credit to those who said that the mother herself is throwing them out. To be sarcastic, I'd say that Minnie is sparing me from feeling sorry for the poor baby birds. 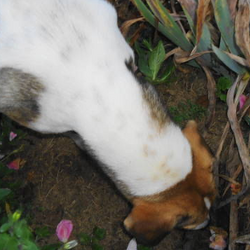 I like Minnie's hunting instinct and I always congratulate her for what she does, especially when she finds a mole that destroys my lawn or the flower beds. Until a year ago, she would find any mole in the garden, but lately she seems to have lost her hunting appetite for moles. Or is it that Miss Mole has become faster and more clever? Last fall, she ruined part of my lawn by making more than a dozen hills all around it. And what do you think Minnie did? Nothing, absolutely nothing! She would just come and sniff each hill, but she never dug any of it, not even once! 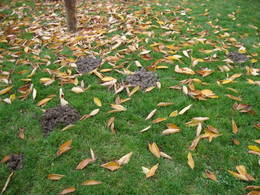 I've been so relieved all these years, thinking that Miss Mole would never damage my lawn anymore - yet, it is happening again! 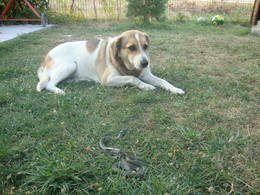 But Minnie is still my little fearless hunter, because she not only hunts small, harmless animals, but also snakes. My husband is so afraid of snakes that he didn't want to go outside when he was home alone. For those of you who don't know, my husband is blind, that's why he fears snakes or other creatures. I think it was my mistake, because I told him about every snake I saw in our yard. However, those are small, thin, harmless snakes - we're calling them the house snake - yet, he's still afraid, because he can't see them. He somehow became more confident since we rescued Minnie because she finds and kills them all. Maybe the funniest hunt that Minnie does is on mice. They make tunnels underground, like moles, or just use the moles' tunnels, yet they come out through a small hole - dozens of holes, all over the garden! 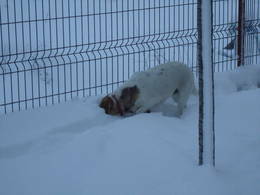 Minnie goes to the hole and pushes her nose in it, sniffing with noise. 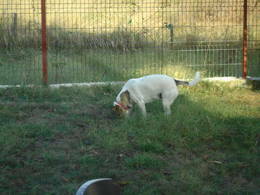 And, then, she digs and digs and digs and digs - so fast that she catches the mouse before he knows it! This is why I find large holes between my roses, or in the lawn and that's why I've also lost some of the plants - which Minnie dug out, while trying to catch a critter. In the winter, when the yard is covered with tall drifts, she's really funny when hunting mice, because she just throws herself with the head in the snow and she goes deeper and deeper - until only her tail is out! 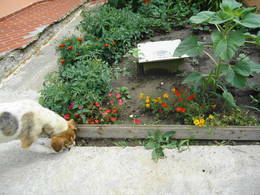 Minnie doesn't dig every hole, but only on those where she sniffs a mouse. Sometimes, I see her standing still, with one foot up, ready for attack - usually, in front of the ditch lily bed or the mums bed, which are so many that offer the best hiding for mice. Then, in an instant, she just throws herself into the plants - I know it's not the plants she's trying to destroy - against the poor creature, who had the bad luck to pass through my garden. Of course, it doesn't matter to her that some of the plants are ripped off during the process! I don't mind too much either, because those are already too many, so Minnie is somehow doing me a favor by ripping some of them out. 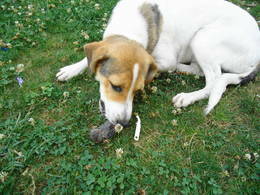 When she catches the mouse, she brings him on the lawn, where she decides what she will do with him. The mouse might be hurt or dead, but if he still still moves, then Minnie jumps like a cat, and catches him again, carrying him by his tail - poor, poor mouse! Sometimes she eats the mouse, which I can't watch. For some people, it may be cruel, but this is animal life! Speaking of cats, we had one until two years ago, Kitty - that is, until my grumpy husband decided that he can't bear her fur anymore. I suspect he was just jealous of her always sleeping in my lap - really, he is too big for that! However, I took Kitty to my mother's house, where she is happier now and I am more relieved to know her safe inside a home. When she was living at our place, Kitty would go outside everyday and she even spent once several days out, to my despair! Kitty is a nice cat and she made friends with Minnie, who left her alone and they didn't fight. Like Minnie, Kitty enjoyed hunting sparrows and she would watch them near the thuja, where most of the sparrows in my yard are hiding. One day, she came on the terrace, with a sparrow in her mouth. She dropped it on the floor, at my feet, but on the next second, Minnie jumped, grabbed the poor sparrow and ran, leaving me and Kitty in awe! That was Minnie's afternoon snack on that day - I understood that later when I saw her kibble untouched. 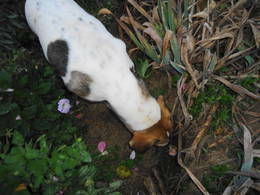 Another one of Minnie's habits - maybe an ancestral one - is to bury the bones I give her to chew. She buries the big beef bones and even bigger bread chunks. 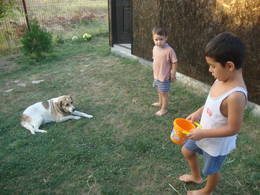 Moreover, once I found a small rubber ball I gave her, buried near a rose. I haven't seen her doing that lately, but most surely she does that, because she has it in her genes - or, is it something she has learned while wandering around, as a stray? She has to save those bones for later, just in case - same as she prefers to eat a critter, even though she has kibble in her bowl - because nothing compares to a fresh, little, juicy mouse, isn't it? I can't even think of that image! Another strange hunting instinct makes Minnie steal different things, such as our plumber's expensive pliers, my very expensive leather gardening gloves or my grandson's undervest, which the wind blew down the lawn. All things were recovered, with small or severe damages - irreversible for the undervest. I now have gardening gloves without one thumb, but the plumber was luckier : his pliers' handle were just a little bit chewed. My grandson tried to recover his undervest, without any luck. They say each of us learn from our own experience, so that's what we all did, learn to never leave anything down the floor, where Minnie could get it. I guess we were lucky she didn't bury them! However, I guess those were just puppy play, which are behind us now. Minnie doesn't steal anything anymore, except some stick or branch I cut off from the trees. Or, sometimes, paper napkins are flown away by the wind and Minnie finds it. Well, you might have guessed where I find both stick and paper napkin - yes, on the lawn, where Minnie puts all her trophies. Only she doesn't eat those, just shreds them in very small pieces, which doesn't please me very much when I need to mow the lawn and need to clean the lawn of all hard objects, such as small pieces of wood. But all in all, Minnie is a sweetheart and her presence in our life is a blessing. The least I can do for her is to bare with her small 'accidents', same as she bares with our grandkids, who are yelling and running after her, all over the yard. They think they are playing, but the poor thing is terrified and doesn't know where to hide from them. 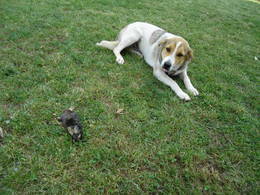 Yet, there is something my grandsons respect and that is Minnie's hunting instinct. 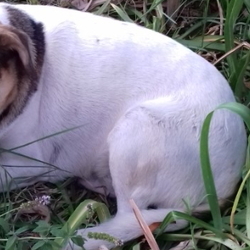 Minnie has become their hero, after they saw her laying next to a dead snake. They've realized that Minnie, even if running from them when they are chasing her in their play games (sometimes, with toy guns!) is, in fact, a real fearless hunter, who protects us and our home. That's why they are now thinking of Minnie as their little brave sister, from which they can learn so many things, including courage.